This novel is one of the major sources for Frank Harris' unenviable reputation as a schemer. It portrays a man, 'John Johns' of the title, evidently based on Harris, who uses his success with women to advance himself. There are some aspects of the portrait which hit home: Harris did marry Emily Clayton for money and power, just as John Johns marries a similar widow Humphries. But Carrel makes his character too shallow, too all-of-a-piece, too simple a villain, for the identification with Harris to be successful. Let us take a quick look at Carrel's story. John Johns, a humble Guernseyman, but of Welsh descent, arrives in London after undescribed adventures in Australia. (The disguise is tissue thin: for 'Guernsey' read 'Ireland', and for 'Australia', 'America'.) 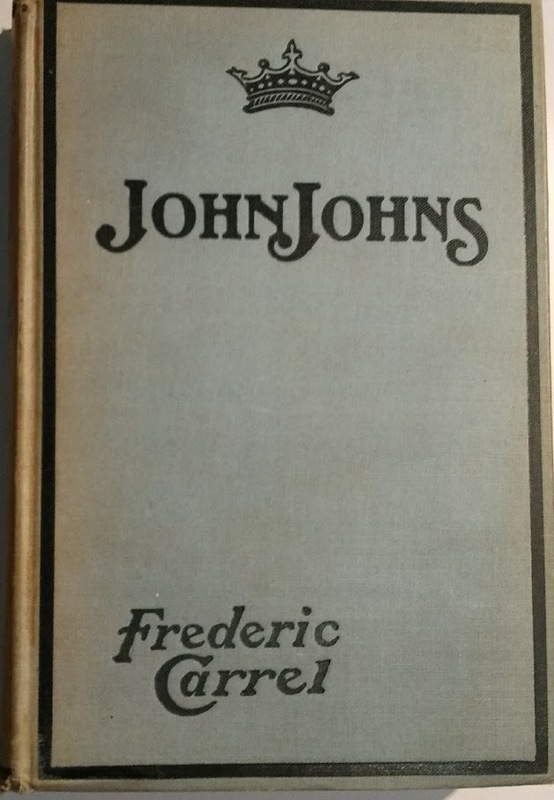 Johns is impoverished but manages to get a job on a newspaper, whereupon he advances himself by seducing the owner's wife and exposing the editor as a drunken philanderer. He takes the editorship himself. The paper being a radical one, he at this time publicly espouses the socialist cause and aids in the campaign of one Parker, making a highly successful speech in his support. Secure in his position, he then pusues the aforesaid Mrs Humphries, dropping the wife of the newspaper proprietor, (but retaining his other mistress, another, but poorer, widow). He is successful in his pursuit and marries her, but not before making her sign an agreement which gives him half her fortune while she is alive, and all of it in the event of her death. He thereupon drops his radicalism and takes up with the other side, gaining the editorship of a Conservative review which he takes to with gusto. Carrel depicts him as a vulgarian who merely poses as a man of the arts, roaring at English taste just for the hell of it and lording it over writers more talented than himself. But his adultery is discovered, and his reputation suffers. His wife now sees him as he is, though she stays with him, for she loves him all the same. Johns for a while becomes something of a drunk, and there is a scene with a foppish poet crony - whom one takes for Wilde, though the portrayal is even more unfair than that of Harris - where through the intervention of an inadvertently hilariously caricatured wise-old-man, Johns realises he is wasting himself and immediately cuts back on his drinking, drops his bad companions, and gets back on the scheming track. Eventually his unfortunate wife contracts breast cancer and starts a slow death, while Johns makes up to a millionaire's daughter, with whom he elopes just one week after the eventual funeral. With Johns now safely set up for life, the book comes to an end. Needless to say, this does something of a disservice to Harris. No-one knows exactly how he got his first editorship, but there has never been any evidence that it was through the auspices of the proprieter' wife. As I say, he did marry Emily Clayton for money and position, but it was she who pursued him, tickling his ambition with the promise of financial security and easy access to circles otherwise denied him. He did indeed take up the reins of Conservativism, but his speech to the South Hackney Conservative Association was actually dedicated to the cause of the working man. At that time the only two parties of government were the Liberals and the Conservatives, and Frank detested Gladstone, so the Tories were the only choice if he were to gain entry to Parliament. Rather than helping himself to half her fortune, and getting the rest at her death, Frank grew bored with his bourgeois second wife and they separated, much to his financial detriment. And his third wife - though they were not actually married until 1927, almost 30 years after they first lived together - was to be simple Nellie O'Hara, whose father was no millionaire but a humble Irish soak. Of course the facts are not important if the man is painted plain; but Carrel's crude sketch of Harris is no likeness. 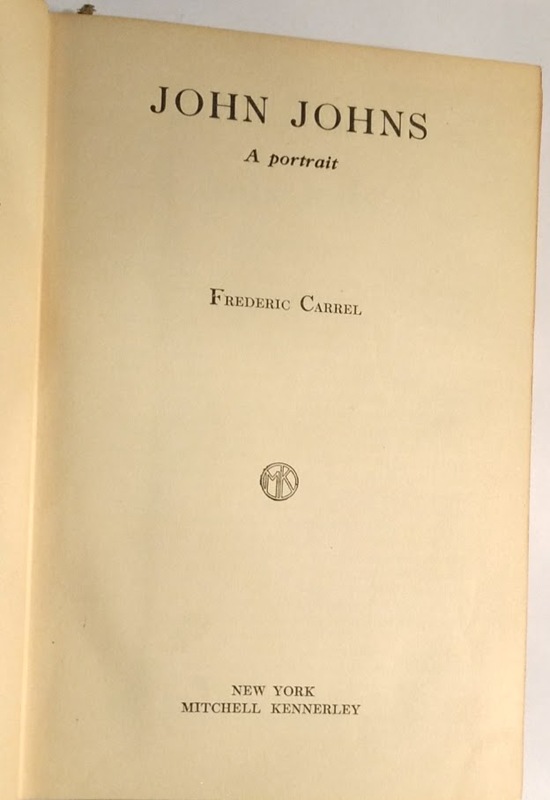 The attraction of Harris is his contradictory nature: Carrel has a stab at this by making Johns moved by scenes of beauty even while he plots his next move; but this is not enough. Johns is self-aware and cunning, Harris was outwardly boastful and inwardly plagued by self-doubt. Johns never has an opinion that is not a pose designed to flatter the company, Harris was frequently the loud propounder of the most unpopular views - in the most extreme case his perverse support of Germany in the First World War cost him dear (though, in fairness to Carrel, his book was published in 1897 so that particular Harrisian move could not have been anticipated). In summary, this book is best read to get an idea of how some people reacted to Harris and what manner of man they took him for, rather than any sort of veiled biography. Carrel, if one can judge him by his work, comes across as rather a mealy-mouthed, ungenerous character, with a strong streak of sentimentality, though a fair enough writer to make his book an easy read.